Ready to update? Download 2.1.8, or to update from within Sandvox choose Check for Updates… from the Sandvox menu. Also, for those of you who are still using Sandvox 1.x, you may be interested in bumping up to version 1.6.10. This update works around an incompatibility with Safari 5.0.6 (Leopard and Snow Leopard) and Safari 5.1 (Lion). Download 1.6.10, a compatibility update for Sandvox 1.x users. We’ve been working with companies who create and sell their own add-on designs for Sandvox so that their designs are not only compatible with Sandvox 2, but even take advantage of some of the new features only available in Sandvox 2. Over the last couple of months, many of our third-party designers have come through and updated their offerings. BehindTheRabbit updated most of their designs shortly after Sandvox 2 was first announced. Be sure to check with the designer or look at our Sandvox Designs listings to check if the designs you are interested in can take advantage of Sandvox 2-only features such as pop-up menus and block quotes. This is our monthly feature that spotlights a few websites created with Sandvox 2 that we think show off the application’s features well. If you are hoping your site will be featured in our newsletter, make sure that your website is built with the latest version of Sandvox, and that you have submitted it to SandvoxSites.com! If you would like to have your website considered for our Websites of the Month spotlight, just choose “Submit to Site Directory…” from the Publish menu in Sandvox, and fill out the details about your site (or sites). Doing so will get your website listed on SandvoxSites.com, and we may choose to feature your site in a future mailing of our newsletter. We see a lot of photography websites, but Mike Dowsett from Essex in the UK has raised the bar with his work. View his incredible images at Wildlife Gallery. Mr. Dowsett commented that Sandvox 2 works well for him as he likes how quickly he can get his images onto the web without jumping through the usual hoops with other platforms. He has kept his site simple, yet complete. The teaser images on his home page compel you to navigate to the interior pages. Interestingly, contact information is part of the home page; there isn’t a separate landing page devoted to contact. We would be curious to see how well that works. Mike, let us know! 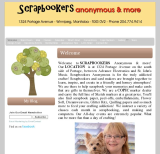 If you would like to see an example of how to effectively market your brick and mortar store to your geographically-related clientele, check out Scrapbookers Anonymous of Winnipeg, Manitoba. Often we run into local websites that are incomplete in some glaring way. Marilyn Whatman has thought of everything from providing her store hours, map and class schedules to upcoming conventions. Her enthusiasm is quite evident! And, she recognizes the importance of keeping her site current. 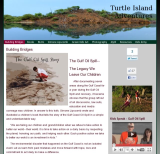 Ms. Whatman has decided she may have a knack for website building after her initial effort with Sandvox 2. She comments, “I loved how easy creating links was; dragging and dropping pictures to create a photo album was also a breeze. I never thought that I would be able to create my own website to look so professional, and I did it!” Agreed. Clearly, Simone Lipscomb is passionate about the environment and the after effects of the Deepwater Horizon Gulf oil “spill” of 2010. Specifically, she felt compelled to find a way to teach children about the importance of maintaining a healthy planet by writing a book that captures the essence of the tragedy in a language that kids could easily grasp. If this website looks familiar, it might be because this website is also featured as an example in the “welcome” window in Sandvox 2! Congratulations to this month’s featured websites!